While I could have improved the test conditions, such using more natural light, but for practical purposes, a consistent light source is sufficient to seeany obvious differences, which is why they recommend sunny days with the gray card in the shade. 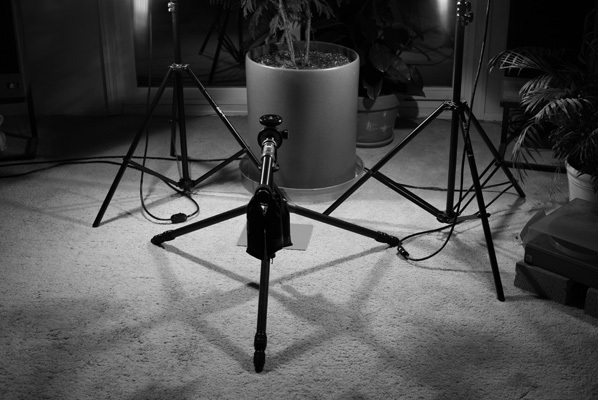 The photo of the setup was taken at night when the test was run in the early afternnon. So, general observations? First, there are difference across the range of zone 1 through 9 for three three ISO ratings, so you do get the full range of 9 stops of the zone system at any ISO speed using monochrome setting. Some more detailed studies have indicated additional 2 stop, 0-10, but I don't see that where it would be distinguishable here. Second, there are differences in each ISO speed from zone 1 through 9 across the ratings. ISO 100 seems to have the greatest differences meaning separatng each zone better. And ISO 400 and 1600 have less difference meaning you lose some distinction in zones 1-3 and 7-9. This means you're likely to lose some detail in these zones in real photos. In conclusion, it's fair to say as reported, you can get at least a 7 stop range in monochrome with the 5D at ISO 100, and at perhaps 5-7 at ISO 400 and 1600 depending on the scene and light. But personally I would stay with 7 for ISO 100 and 5 for the faster speeds and adjust zone 5 accordingly. That's really not much different than black and white films.